Gary Braasch is an environmental photojournalist and writer who has been documenting climate change for over 13 years. Gary was the first photojournalist who journeyed extensively, including to China, Australia, Tuvalu, Antarctica, the Arctic and the great mountains of the world, documenting the effects of climate change. This work continues into its second decade, with new emphasis on re-shooting rapid changes and on the solutions which will reduce greenhouse gas emissions. He’s the author of several books on the subject, including Earth Under Fire: How Global Warming is Changing the World (University of California Press). We recently spoke with Gary to learn more about climate change, photojournalism, and visual communications. How did you first decide that you would focus your photography on images of climate change? My first work experience as a journalist was in television news. Even thought it was near the end of the Vietnam War, they were drafting people, and I had a low number. I was drafted as an Air Force supply person, not as a journalist. When I came out, I didn’t want to do daily journalism, but natural history. Photography was my strong suit, so for the first 20 years of my career, I did natural history photography. Covering natural history evolved to natural disasters, like the Mt. St. Helens explosion, old growth logging, coastal damage, and destruction of forests in the tropics. I got assignments for popular magazines, which almost always involved the human element, so I slowly transitioned to doing more people, location, and outdoor action photography. Around 1998, I began going into the field to shoot what climate scientists were doing, and that work became World View of Global Warming. After a couple of years, it transitioned from climate scientists to people feeling the impacts. I’d go to Tuvalu in the South Pacific to shoot sea level rise, or Bangladesh for flooding and erosion. Some of this early work is among the most published of my pictures. These experiences taught me something important as a photographer: people are interested in people. That type of photographic approach works. When you see people with their homes washed away, it makes climate change real, much more so than the pictures of places distant from us. These people have houses, jobs, life experiences that are similar to our own. I already knew how powerful pictures would be. When I saw that climate change was missing the pictures, I saw a role I could play. Tell us about one of the most moving images or set of images you have used to tell the climate change story through photography. People standing at the edge of a road in Bangladesh. 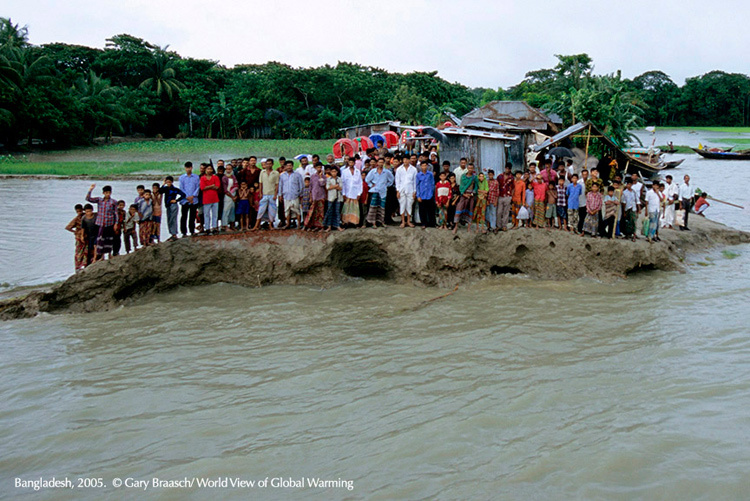 In 2005, I went to Bangladesh because it was one of the places experiencing sea level rise and coastal storms – two effects of a warming atmosphere – where there are many people living at sea level in estuaries. I chose to go there when there was good weather, so I could learn what “normal” weather was. I wanted to capture the people going about their normal lives. I was connected to a family in the Delta below Dhaka. We went to see folks who had been affected already by climate change. I was looking for a picture that talked about that. I knew a statistic that at the time, in 2005, the average amount of CO2 per capita in America was 80 times that of a Bangladeshi. So, with that in mind, I thought I could go to a market and find 80 people to create a great shot. When we got to the village by boat, part of it had already washed away. The road had turned into a dock! So, I started photographing it. People saw this foreigner taking photos. More and more people came to see what I was doing. Eventually, about 80 people showed up! Bingo, the number I was looking for. That particular image “just happened,” and it is now one of my most published pictures from the World View of Global Warming project. There are places like that all over the world now, including in America – Hurricane Sandy showed us what other places in the world have known for years. In photojournalism, you take advantage of things that happen by chance. You increase that chance by doing the research in advance, understanding what makes a story, and just being there. A whole lot of pictures get away from us when we are not prepared for that moment of chance. Be prepared, know your subject, know the message you are trying to get across. Share with us some wisdom around telling a story through photos. People like people, common life events and life passages. Capturing what a person’s life is like through the image makes a more powerful picture. When people are active and working, it brings the picture more alive. Those are the things that connect people wherever they are. To tell stories, you do have to get close to the people. You have to talk to them. You can’t stand across the street. In order to get a story, you have to talk to the people. What have you found that sets photo essays apart from oral or written storytelling? Sequences of photos expand the story and tell that story from beginning to end. It allows you to see different aspects of an event or location or passage of time. You get to see the full picture: What happened? What was the result? How did people react? Look at what National Geographic publishes or look at pictures on the news. They are often about the reaction people have to something, not the event itself. What does it look like from the person doing the action, and what is the perspective from the observer? Think about Hollywood movie techniques for building a story with visual interest. Take the time to go from big picture to that one telling detail; from a pile of tools in a corner to a close-up of a person’s hand on a hammer. The more we tell stories in a way that people can personally connect with and be moved, the more we can inspire everyone to act.